Why Rent a Motorcycle in San Francisco? >> Why Rent a Motorcycle in San Francisco? If you’re a motorcycle enthusiast you know the pain of leaving your bike behind when you take vacations or business trips away from home. It’s not as if you can put a luggage tag on your bike and drop it off at the TSA checkpoint. Until now, you may have thought that getting away from home meant relinquishing yourself to rental cars, cabs, and public transportation. But if you’re visiting The City by the Bay, you can reclaim a bit of your independence by renting a motorcycle in San Francisco. San Francisco is perfectly located in the heart of some of the best “Motorcycle Country” in The United States. Right in the San Francisco Bay Area you’ve got gorgeous views of the Pacific Ocean, rugged cliff-hugging rides, and iconic locations like the Golden Gate Bridge within a few minutes ride of your hotel. Head north and you’re looking at some of the curviest hill climbs on the West Coast in destinations like Muir Woods, Big Sur, and Livermore. Head south and you get into the glitzy glamor of Los Angeles, the natural beauty of Joshua Tree National Park and Death Valley, and the seaside excitement of San Diego. Thinking of a destination ride longer than a few days? Exploring California’s Wine Country on the back of a bike is a wonderful getaway for wine enthusiasts. These world-class vintners will offer their best and ship it home for you! Looking even further abroad? Maybe you fancy a minimalist vacation toting nothing more than what you’ve stuffed in your saddlebag? Multi-day Road trips into Oregon, Nevada, and Arizona make for some wonderful moto-memories. Any and all of these locations are excellent day trips or long weekend rides while you’re in California . . . but only if you have a bike. There a number of businesses that rent motorcycles in San Francisco but one of the best is Dubbelju Motorcycle Rentals. They’ve been owned and operated by motorcycle riders since 1991 and provide expert local advice to visitors from across the country. Their shop rents classic rides like Harleys, Triumphs, and Ducatis as well as more modern roadsters like Suzukis, Yamahas, and BMWs at affordable rates. The staff inspects every bike before it hits the road and can offer great road trip route advice free of charge. The company also offers bike tours in Northern California for groups of like-minded road warriors who enjoy the comradery of riding as much as the sights they see. Are You at Increased Risk of a Motorcycle Accident on a Rental Motorcycle? Riding far from home (especially on a bike you’re not 100% familiar with) can lead to a variety of challenges and potential increased risk of a motorcycle accident. You owe it to yourself to ride as safely as possible—obeying all the traffic laws—so you get home safe and sound. But sometimes that choice is not in your hands. In the majority of motorcycle accidents in San Francisco, a motorist driving a car is at fault for the crash. That means they could be liable for the financial impact of your accident as well. If you’re visiting California and do find yourself in a motorcycle accident in the San Francisco area, we’re here to help. The experienced San Francisco motorcycle accident lawyers at Sally Morin Personal Injury Lawyers have successfully achieved millions in dollars of settlements for victims of careless and/or reckless motorists. 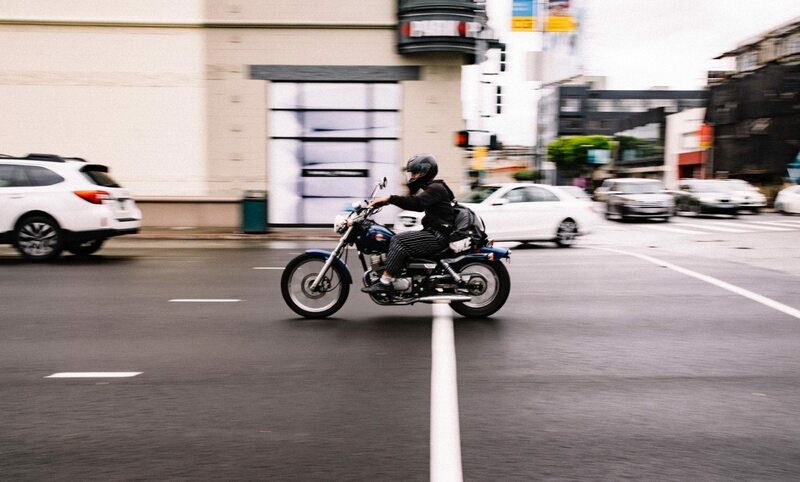 We also have a particular knack for long-distance representation and have successfully represented clients for their San Francisco motorcycle accidents, even though they have returned to their home outside of San Francisco, California or even the United States. To see what we can do to help you get your life back on track, call (415) 413-0033 today or submit your case online.